Discussion in 'PS4 - Hacking & Homebrew' started by RiPPERD, Oct 8, 2018. This is now fully working! The main reason for this tool is to make RipKits (smaller game files with things riped out) this is usually language files, videos etc. However another use is users that dont know how to modify games, add cheats/mod menus, files etc now can... so with the devs/modders posting their patch files made by this tool you will be able to just click a buttom and enjoy modded games... This could be Loads of ammo... Infinite Health... Debug menus etc via either modded eboot.bin file or modded game files. PLEASE NOTE: Compressing/Making patch file may take a long time depending on your specs! The app CANNOT crash so just wait! Decompressing/Applying patch will be a LOT faster than making the patches! Again the app CANNOT crash! Its an AIO patcher to release a patch file instead of users downloading whole games again. Back in the PSP and PS3 days this is how RipKits were made... ive made it slightly different now due to windows 10 and other requirements that only work on older versions. rename game pkg to "original.pkg"
This tool can also now be used to make Modded Games, Cheats, Texture Changes... Anything really... If you mod it this will make a patch for it. TomLiftsAD, nox13666, Kenneth Luton and 293 others like this. REQUEST: what im looking for now is modders/cheaters to use modded eboot.bin files or whatever is used for cheats now so this can be used for applying cheats directly to the game. this way you wont need a computer/laptop to apply cheats that just crash the game... with little to no support when things dont work correctly. Bryan5421, Alx_2004 and Belafontep like this. lol why didnt you ask in the thread? patch.RiPPERD - this is a file my tool makes to keep the patches/changes in place and encrypted if you look at bottom spoiler for post #1 it has a patch for dead rising 2 mega mod that i made for ps3 i ported it to ps4. 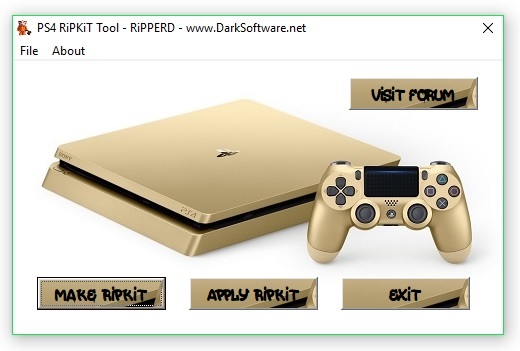 download this and my tool (if you have the game) then copy the patch files to the tool directory, now copy the game pkg to same folder and rename it to original.pkg run my tool click apply ripkit... enjoy! now you will be left with 2 new files! now they will have a new PKG file with the FULL original name the game was called so CUSA0000-V1.00 etc in PKG format ready to install! this tool was originally made JUST for ripkits! but due to the limited access of ps4 at this stage the way i made these ripkit tools for PSP and PS3 didnt work with PS4! but by doing it this way it opened it up to doing a lot more stuff like modding game files, adding cheats, branding... maybe more but thats as far as my ps4 knowledge goes lol. Rimk92700 and Belafontep like this. Did you used to make these for psp/ps3 your name seem familiar to me ? some sources already have game updates in... so wont be needed. the psp and ps3 ripkits were a LOT easier to make... this is a work in progress i will continue to add features and keep it updated. any files that have changed would now be applied! this way you can not only make it a ripkit... but also an updater! that's why I doubted, cause if a game woul be 30gb for example, couldn't a patch.ripperd be 15gb or something? Im not sure what is going on as i must be missing something from back when psp and ps3 ripkits were done... my memory aint great lol. right i have tried other compressors with no luck... it seems that PKG files canot be highly compressed with ANY tool including ARC compressors.... i think ps3 used to be ISO format which could be why compress was so high. i will download a psp game and try my tool on that see what results i get. for now though the patch files will be rather big.... i will also test using it as a patcher to add/remove/replace files from a PKG file this may help make the patches smaller.... this will not be a quick thing though. this is big news for this now. i have also contacted the creator of 1 of the tools already out there to make the whole process automatic for end user. Alx_2004 and cruel like this. I am sure there where a lot of dummy files in psp/ps3 from what i can remember. But that was years ago and not really my thing i was more beta testing and helping jason ect.. I used to help out on a few things back in the day thats why i thought i recognized your name from the days maxconsole was a good site.